Persnickety Elephant has an itch--a big one--and he can't reach it! While he isn't above asking for a little help, no one is up to the task. Turtle is too lazy, Snail is too slimy, and Alligator... well, Elephant isn't sure he wants his assistance. Does Elephant have to do everything himself? 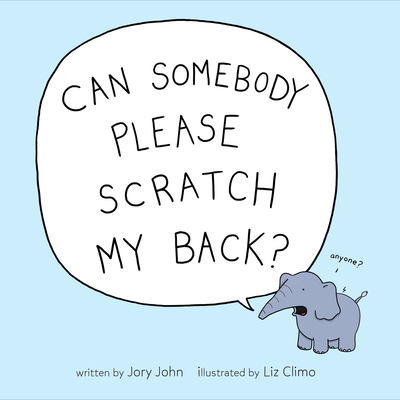 Jory John's signature deadpan humor pairs perfectly with Liz Climo's oh-so-innocent-looking animals to create a slyly ironic read-aloud that will leave kids and parents in stitches. Jory John is the author of multiple books for children and adults, including the New York Times bestsellers The Terrible Two and All My Friends Are Dead, as well as the popular Penguin Problems and E. B. White Read-Aloud Honor book Goodnight Already. He lives in Oregon with his wife. Liz Climo is an author, illustrator, and animator currently working on The Simpsons. She has written and illustrated several children's books, including the Rory the Dinosaur series, and two comic collections based on her incredibly popular Tumblr, Hi I'm Liz. She lives in LA with her family.